PHOEBE WANG: What strikes me about The Better Monsters is its scope, that although it’s a slimmer collection, it spans decades of experiences and journeys. Can you tell me a bit about the genesis of the manuscript? What were some of the earliest poems in it and what instigated them? PUNEET DUTT: Some of the earliest poems in The Better Monsters were ‘Coordinates’, ‘Meridian’, ‘Rhumb Lines’ and ‘Blanks’. The initial spark of inspiration began with the return of people I know who were working abroad in Iraq and Afghanistan. I began to think through and imagine, using what little fragments they shared, the words and stories. Then I began to research those unfilled pockets, and the work began to take the shape of poems. PW: Your work contains both overt and subliminal political critique of notions of boundaries, Americanism, the fall out of war and displacement. This is something that I’m always wanting to include more of, but in a way that avoids being preachy. How do you grapple with the role of poetry to educate the reader and to create a sense of exigency? PD: I feel that there’s both good, bad and grey in the places we live and come from. I don’t attempt any intentional critique, but if collectively these words and experiences become one interpretation to the reader, that’s fine. I’d like everyone to interpret the work on their own. Also, my intent is not to educate the reader in any way, though I hope they will come away with some new kernel of understanding. I hope to engage the reader so that the reading becomes more of a conversation, and not necessarily a critique of any one position. I wanted the research, interviews and individual experiences to speak to me, and inspire the work from the perspective of other voices. And with experiences that were personal, I attempted to speak to those around me to gather as much outside of myself as possible, to add a new dimension, a new layer, so it wasn’t solipsistic. That distance is necessary to be removed and to avoid didacticism. PW: In ‘Blanks’ and other poems, there are form-like blanks left on the page, and throughout the book there are spaces that suggest absences and silences. You have said in an interview on the Asian Canadian Writing Workshop that “What interested me were the silences marked by these voices. How they chose to skip, rush through, or leave out certain things”. How did you come to render those silences visually on the page, particularly in a poem such as “In What Place,” and how can the reader ‘fill in’ these silences, if they’re expected to at all? To me, they also read as pauses and stutterings, as if the speaker cannot quite bear to share. Additionally, The Better Monsters employs a pastiche-like lyricism, using fragments and juxtaposing images with dialogue and found text to evoke so much more than the sum of its parts. As a reader, I feel as though I’m left to assemble the books various elements and scenes. Were these stylistic devices deliberate, and if so, how did you arrive at those choices? PD: The spaces and blanks were intentional stylistic devices used to match the cadence of natural speech, when people attempt to think through and speak about difficult things. In ‘Blanks’ the devices were used to express how universal and timeless violence is. How the reader can insert any country into those spaces, in whatever year, and it will still make sense, be possible, could still happen. Additionally, some of the text and dialogue fragments were framed in a certain way for security reasons, where military personnel were not permitted to speak on the record. So some poems were redacted or removed before going to print. PW: You employ quite a few epigraphs in your book—how are they meant to help prepare the reader for what’s to come? PD: These were books I was reading or inspired by as I wrote the manuscript. So I hope that readers see The Better Monsters in conversation with these other works. For example, Mtshali is a beautiful poet little known in North America. I was introduced to his work while in South Africa. His work is remarkable, and as I read him, I was inspired to write ‘alien, alien’. At the time, I was also reading Claudia Rankine’s Citizen and Frantz Fanon and some of the poems were written as a response. Hecabe, the Odyssey and The Mahabharata were lingering works I had read before, which led me to think through ideas of home, place and belonging and the loss of it all. PW: Your poem “Coordinates” explores the impossibility of calculating distance in the literal and physical sense, but it also seems to be about other types of distance. What kinds of distance across time, bodies, knowledges are at work in The Better Monsters? PD: Distance is a frustration I learned very early on both in the literal and figurative sense. How travel is mostly necessity and not a luxury when family and friends are scattered. How families like ours are always calculating distances, how long and how far from each other we constantly are. In a figurative sense, with each journey, a new chasm, a new gulf erupts after each new arrival, separation and departure. And these mental distances intrigued me because of what is shared versus what isn’t, and how silence becomes a more natural way of communicating various experiences. PW: I find myself feeling purged of the preoccupations, even the mindset and the stylistics of Admission Requirements and it’s been a slow process for me to gather myself for new projects. Is the same for you? Do you see yourself continuing to explore the themes of migration and displacement or writing in a similar mode, or are you now searching for new directions? PD: I’m not sure that I’m purged of those ideas. I won’t know just yet. Right now I’m in an exploratory phase where I’m writing and reading for fun, without directed intention or pressure. I’m reading essays and short stories, and because of my son, I’m reading lots of children’s books. 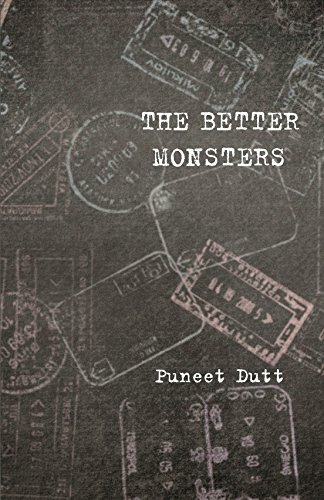 Puneet Dutt’s The Better Monsters is shortlisted for the 2018 Raymond Souster Award. Phoebe Wang’s collection Admission Requirements is shortlisted for the 2018 Gerald Lampert Memorial & Pat Lowther MemorialAwards.